Marine Iguana, Hagfish Day Star | WhaleTimes, Inc.
You may not have met this intrepid island critter before, but we think you’re going to fall in love. The marine iguana only lives in one location on earth — the Galapagos Islands (at the equator). Its intriguing looks are only surpassed by its intriguing life. 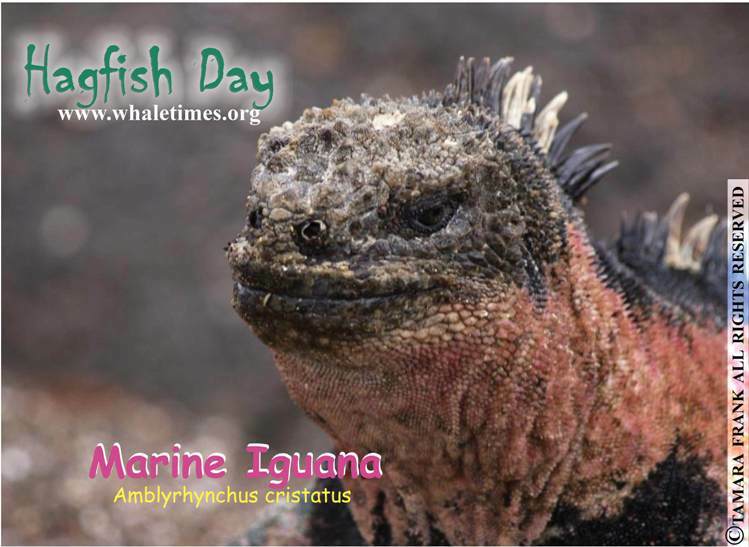 It may look tough, however, due to its limited distribution, the marine iguana population is at risk the marine iguana can be affected by anything or anyone tampering with their limited ecosystem such as extreme weather, people, and pollution. 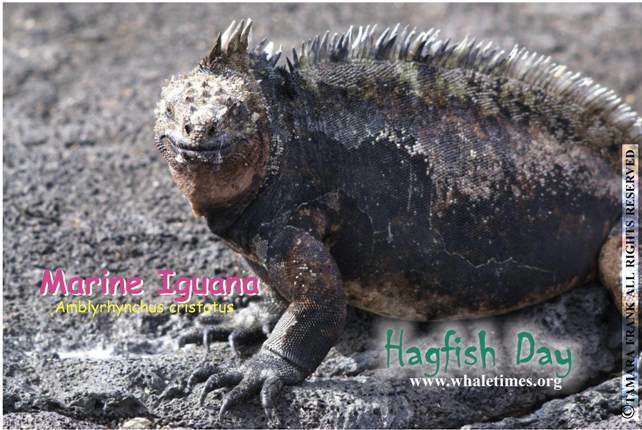 Marine iguanas can be 4 to 5 feet long (1.2 to 1.5 m). That’s as long as a 10-year old kid! Or 2 to 3 giant isopods! Their range is limited to the Galapagos Islands, Ecuador. Marine iguanas stay in shallow water — where they find their food. Dives only last a few minutes. However, some males may dive deep as 65.6 feet (20 m) to munch on seaweed. They can stay underwater about 30 minutes. Marine iguanas eat seaweed and algae. 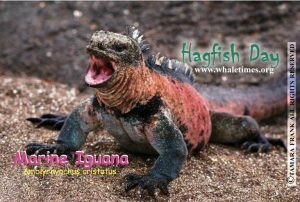 The red coloration on marine iguanas is from the algae it eats, so they are brighter red during certain times of the year. Beauty may be skin deep, but getting past their crown of snot, spiked scales, giant claws, and fierce face is tough! This is one cool reptile. Marine iguanas live along the rocky coast of the Galapagos Islands and is built for scorching heat on land and cold seawater . A marine iguana runs, walks, climbs, swims, and clings to substrate underwater, even in harsh currents. Then there is the matter of the snot. 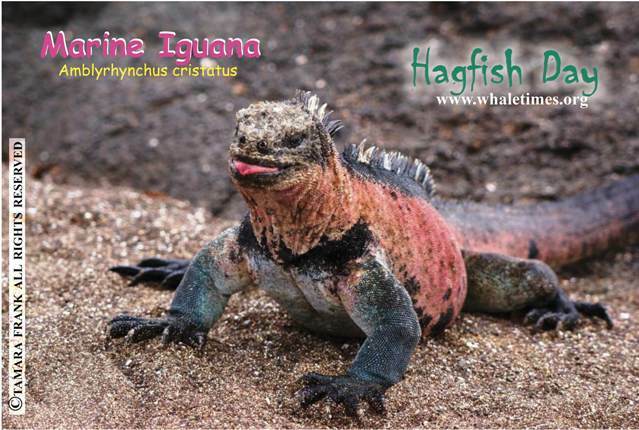 To rid its body of salt it gets from eating underwater the marine iguana sneezes it out. The spray lands on the head and neck, dries, and creates a lovely salty fashion statement. 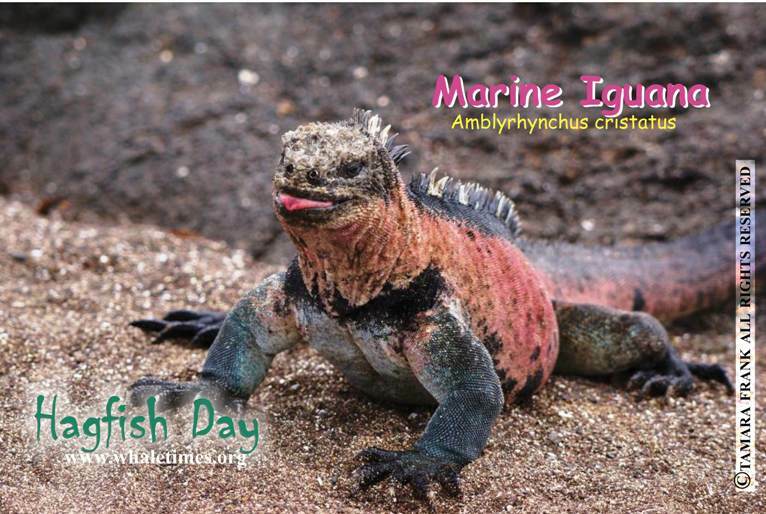 Marine iguanas do not drink fresh water. Scientists do not know why they have the spikes. They fight a lot during breeding, so they may have an antler-like function in the social status.